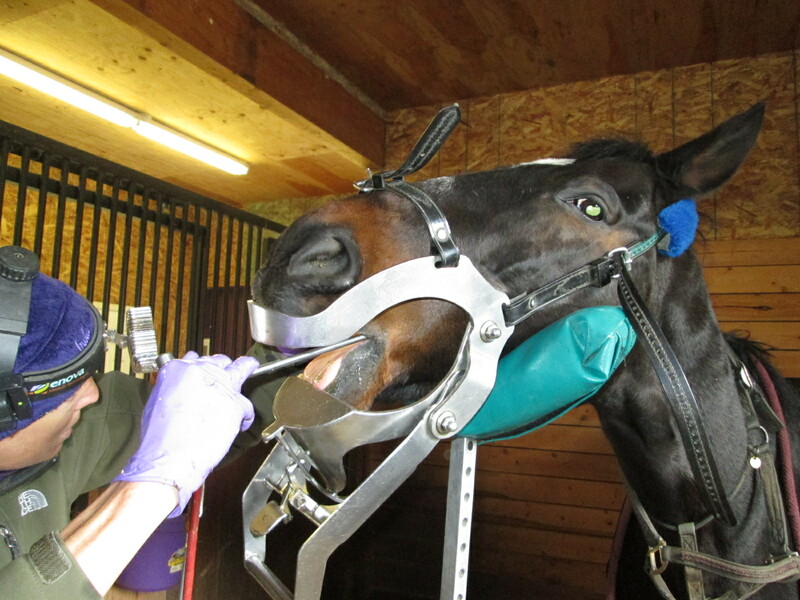 Dental care: Although it is one of the most essential aspects of horse management, education about proper dental care is not often enough a major focus of veterinary training. Because of the nature of equine teeth (very different from dog and cat teeth in their eruption and function) it is important to have proper training in equine dental care. Horse teeth are vital structures and damage can be done if they are not cared for with this understanding. There are those that believe it is best to work on horses teeth without sedation and with hand tools only. I disagree with this viewpoint as the combination of power tools and hand tools in a well educated veterinarian’s hands makes the procedure more efficient, allowing for more exact work with less soft tissue damage. Because the molar arcades go so far back in the horse’s skull, it is impossible to blindly rasp the back molars without a speculum. For the safety and comfort of the horse, sedation should be used and this should always be done by a licensed veterinarian. In the past, very few veterinarians had extensive knowledge about how to make a proper “bit seat,” how to handle waves, steps or other common anatomical problems because of the lack of training in veterinary school, lay dentists (non-veterinarian) have become common. This can be a problem because a lay dentist may not understand heart problems or other medical issues making the sedation dangerous. In many states it is also illegal to work on horse teeth if you are not a vet or working directly with a veterinarian. More pressure needs to be placed on veterinary schools to catch up to the twenty first century and include excellent dental training for those students wishing to specialize in it. More information is available at the website: http://vetequinedentistry.com/vet/. 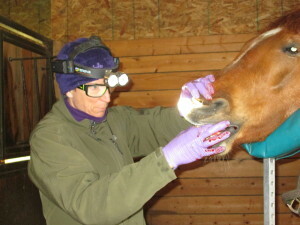 Since I don’t have enough knowledge on equine dentistry, Dr. Mary Delorey comes to the farm to work on my horses. Her website is also full of excellent information. A big thank you goes out to Dr. Erin Zamzow for helping me edit this page. Dr. Mary Delorey examines Mick’s mouth. Without proper dental care, the demands placed on the equine mouth from the pressure of the bit to the pressure in the temporal mandibular joint (TMJ) can be both painful and be the major cause of head shaking, ill-accepance, pinning the ears while riding and a million other riding related issues. Extensive dental problems can be why an older horse quids his food or develops an abscess or will not eat at all. Since roughage intake needs to be common, I don’t think its an understatement to say dental problems can lead to colic and even cost a horse his life. 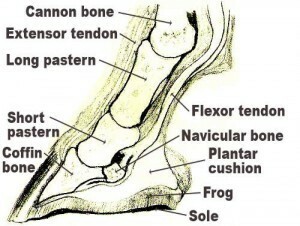 If it were not for humans and our influence over equine footing or the invention of concrete, breeding “purebred” horses with a weak hooves and improper shoeing techniques, the equine hoof would be a remarkable engineering feat. Indeed, it is pretty incredible that a thousand-pound animal can walk around on his middle digit for so many years. There are many website dedicating pages to proper foot care like farrier, Carl Stephens. If a horse can get away barefoot, it could be better for him. 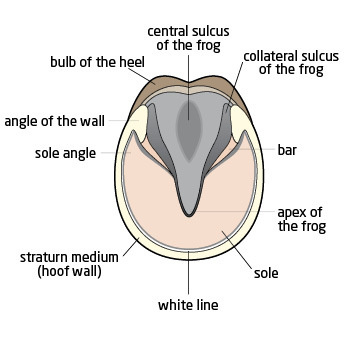 Shoes compress the natural action of the hoof wall, affecting lymphatic flow (very slightly) but few horses can safely go barefoot when the ground is very hard. Some horses, like my thoroughbred, Charlie, were bred for something other than hoof health and cannot go barefoot without boots. Charlie has the thinnest sole of any horse on our farm and because of that he is prone to micro-trauma and stone bruises and even permanent damage to his feet if I insisted on making him go barefoot. But my mustang does pretty well, his feet are as solid as they come, but even then, if we are trail riding on rocky hard footing for hours every week, I would shoe him. I like to have all my horses (even Charlie) go barefoot for 2 or 3 months in the winter. This is a nice compromise. Boots: If I trail ride Charlie or even Tino for an hour or more, I like to boot my horses. I have used or tried Hoof wings, Easy Boot Gloves and right now I use a combination of these boots. Hoofwings twist on Charlie’s back feet too easily but they fit his front feet better than Gloves. If anyone has a full-proof new boot they can recommend, contact me! Charlie can only walk in his boots safely, whereas Tino can canter in his.